Trent Monk and Michael Neagle, the latest to sign with Flicker Records, have a lot in common. Monk and Neagle both hail from Amarillo, Texas, play guitar and have been happily married for five years to women they met at their home church. Plus, they're horrible mechanics when it comes to fixing their RV. However, this duo makes up for its automotive shortcomings with superb songwriting and harmonizing as evident in its self-titled debut, which released in August. While any young guy with a brand new crush might pen such a sentiment, these words are actually sung by two men who have each been married for over five years. And yes, they're singing about their wives. Singer / songwriters Trent Monk and Michael Neagle are as crazy about their wives as the day they met them, and that ongoing devotion is woven into many of the songs on their self-titled Flicker Records debut. In addition to providing musical inspiration, Monk & Neagle's commitment to the respective loves of their lives has also led them to make a rather unusual lifestyle decision. While on the road touring the country, "home" means many addresses for the two men, but only one place - a 1995 Holiday Rambler RV, in which the pair travel with their wives. Rachael Neagle and Micah Monk have come alongside their husbands to join them in their work, and to put an end to the lonely, all-night drives the men were making to be with their wives after out-of state concerts. 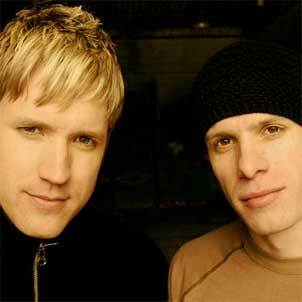 Partnering with producer Ed Cash (Bebo Norman, Chris Tomlin, Caedmon's Call, Bethany Dillon), Monk & Neagle worked tirelessly to craft an album expressing their unique musical combination of pop, rock, jazz, and funk, with a touch of folk. 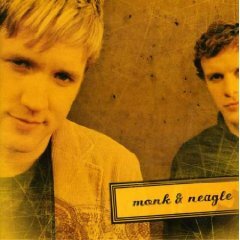 The pair found a musical soulmate in Cash, who became intimately involved in the creation process of the songs of Monk & Neagle, and who ultimately shared writing credits on eight of the project's ten cuts. "In addition to becoming really great friends with Ed, we also found a mentor and a partner," Neagle tells. "We write together and pull from similar experiences we have all had in our Christian walk, in our marriages, and in life." 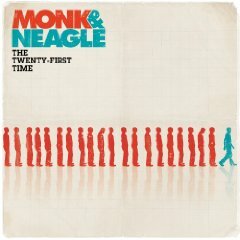 With a well-crafted, hook-laden debut under their belts, Monk & Neagle are poised to spend a lot of time singing that praise as they travel the highways touring this year. But don't think for a minute that they'll travel alone - at every milestone, they'll have their better halves at their side, because there's simply no other girl in the world for either of them.